The BRIGHTS Experimentation Report is finally out! The BRIGHTS Experimentation Report including the results of the experimentation phase has been produced by the BRIGHTS consortium. 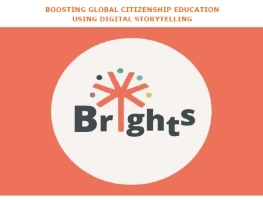 BRIGHTS aims to promote Global Citizenship Education (GCE) in formal and non-formal Education with the help of digital storytelling techniques. The project adopted a phased approach. In the in the first phase, the target group composed of teachers and trainers were trained through an online course (BRIGHTS MOOC) and a workshop on GCE and the use of digital storytelling techniques. In the second phase teachers and trainers tested the acquired methodology with young people in each project country through the delivery of workshops in different settings (Telecentres, NGOs, schools etc.). As results digital stories were produced by youngsters. Did the BRIGHTS Project meet the expected results? Is it the BRIGHTS methodology suitable for implementing GCE? The BRIGHTS Experimentation Report help us answer these questions and understand what it went well and what still needs to be improved. The report is a summary of the national reports written by the partner organisations about the above-mentioned experimentation phase and an analysis of the evaluations performed with different target groups in each partner country. Furthermore, it presents the evaluation results of the implementation of BRIGHTS multilingual MOOC and Face to Face workshops. It is a precious resource for those who want to implement the BRIGHTS methodology as it allows its effective transferability. Please click here to download the English version of the BRIGHTS Experimentation Report. It will be available soon in Dutch, Italian, Croatian and Greek. Last, but not least, we encourage you to join the GCE working group on the Unite-IT platform to join discussions and share your thoughts on GCE with people interested in the same topics!